The Hyundai Santa Fe is a top crossover SUV among consumers. At Straub Hyundai, our goal is to keep our consumers informed about our vehicles so that they can make the best choice for their needs. To learn more about the safety features that come with the Santa Fe, read further. The Santa Fe comes with Rear Cross-Traffic Collision-Avoidance as a standard safety feature. Using the radar sensors from the Blind Spot Detection System, Rear Cross-Traffic Collision-Avoidance monitors for vehicles that are crossing the Santa Fe's path when you are in reverse. This system can engage the automatic brakes when needed to help you avoid a collision. To keep passengers in the back seat protected, you can choose the available Rear Occupant Alert. 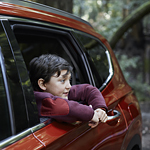 This feature monitors for children and pets in the rear seats and sends you a reminder to check for your precious cargo before you exit the Santa Fe. When this system detects motion in the back seat after the driver has left the vehicle, it will send the driver an alert and sound the horn.